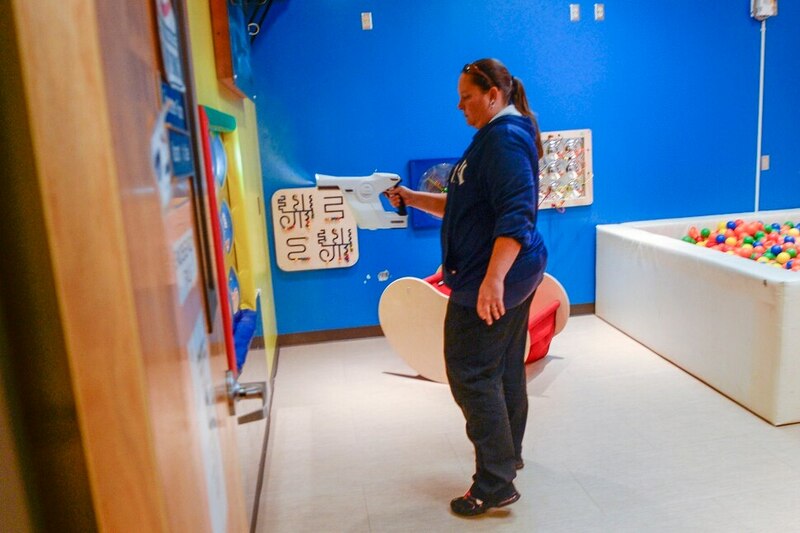 Leah Hogsten | The Salt Lake Tribune Jordan Valley School assistant facility manager Sonya Lloyd uses the Protexus device, Tuesday, Sept. 18, 2018. The Protexus is a chlorine-based, electro static sprayer that kills 99% of viruses with the use of rapidly dissolving chlorine tablets. The gun-like device is operated much like a paint sprayer, delivering a fine mist that covers any object to kill bacteria and viruses. Objects can be handled after 5-10 minutes of drying time and potency varies, depending on the virus chosen. Custodial staff at Canyons School District clean and disinfect classrooms at Jordan Valley School, Tuesday, Sept. 18, 2018. Leah Hogsten | The Salt Lake Tribune Kevin Kelson, (right) custodial coordinator for Canyons School District shows Clayton Halper and Sonya Lloyd how to use the Protexus device to disinfect school desks, hand rails, water fountains, toys, medical equipment, any object that a person or child might touch. The Protexus is a chlorine-based, electro static sprayer that kills 99% of viruses with the use of rapidly dissolving chlorine tablets. The gun-like device is operated much like a paint sprayer, delivering a fine mist that covers any object to kill bacteria and viruses. Objects can be handled after 5-10 minutes of drying time and potency varies, depending on the virus chosen. Custodial staff at Canyons School District clean and disinfect classrooms at Jordan Valley School, Tuesday, Sept. 18, 2018. 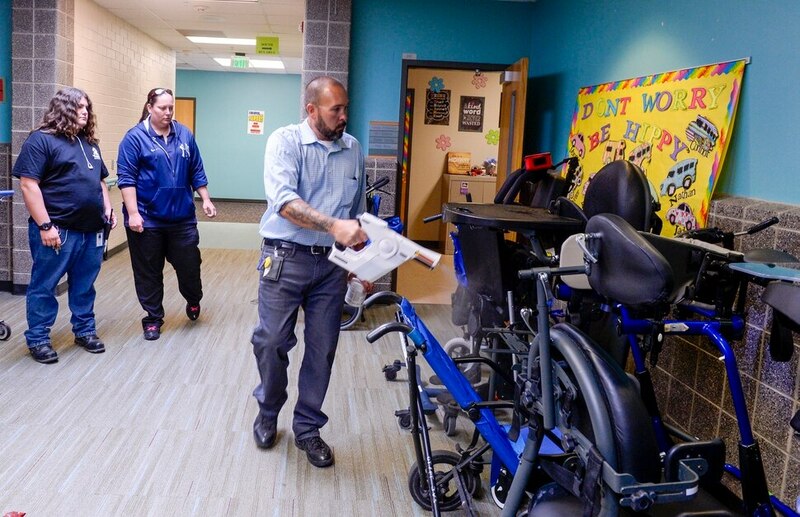 Leah Hogsten | The Salt Lake Tribune l-r Kevin Kelson, custodial coordinator for Canyons School District shows Sonya Lloyd and Clayton Halper how to use the Protexus device. The Protexus is a chlorine-based, electro static sprayer that kills 99% of viruses with the use of rapidly dissolving chlorine tablets. The gun-like device is operated much like a paint sprayer, delivering a fine mist that covers any object to kill bacteria and viruses. Objects can be handled after 5-10 minutes of drying time and potency varies, depending on the virus chosen. Custodial staff at Canyons School District clean and disinfect classrooms at Jordan Valley School, Tuesday, Sept. 18, 2018. Leah Hogsten | The Salt Lake Tribune The Protexus is a chlorine-based, electro static sprayer that kills 99% of viruses with the use of rapidly dissolving chlorine tablets. The gun-like device is operated much like a paint sprayer, delivering a fine mist that covers any object to kill bacteria and viruses. Objects can be handled after 5-10 minutes of drying time and potency varies, depending on the virus chosen. Custodial staff at Canyons School District clean and disinfect classrooms at Jordan Valley School, Tuesday, Sept. 18, 2018. Leah Hogsten | The Salt Lake Tribune The Protexus is a chlorine-based, electro static sprayer that kills 99% of viruses with the use of rapidly dissolving chlorine tablets. The gun-like device is operated much like a paint sprayer, delivering a fine mist that covers any object to kill bacteria and viruses. Objects can be handled after 5-10 minutes of drying time and potency varies, depending on the virus chosen. Custodial staff at Canyons School District clean and disinfect classrooms at Jordan Valley School, Tuesday, Sept. 18, 2018. Leah Hogsten | The Salt Lake Tribune The Protexus is a chlorine-based, electro static sprayer that kills 99% of viruses with the use of rapidly dissolving chlorine tablets. The gun-like device is operated much like a paint sprayer, delivering a fine mist that covers any object to kill bacteria and viruses. Objects can be handled after 5-10 minutes of drying time and potency varies, depending on the virus chosen. Custodial staff at Canyons School District clean and disinfect classrooms at Jordan Valley School, Tuesday, Sept. 18, 2018. Leah Hogsten | The Salt Lake Tribune Jordan Valley School lead custodian Clayton Halper uses the Protexus device, Tuesday, Sept. 18, 2018 to clean object in the school's weight room. The Protexus is a chlorine-based, electro static sprayer that kills 99% of viruses with the use of rapidly dissolving chlorine tablets. The gun-like device is operated much like a paint sprayer, delivering a fine mist that covers any object to kill bacteria and viruses. Objects can be handled after 5-10 minutes of drying time and potency varies, depending on the virus chosen. Custodial staff at Canyons School District clean and disinfect classrooms at Jordan Valley School, Tuesday, Sept. 18, 2018. More than 600 students stayed home from school in Utah County earlier this month — some sick with the highly contagious norovirus, but most just afraid of catching it. Now, it’s creeping north into Salt Lake County classrooms. And the outbreak, hitting much earlier in the year than normal, is worrying public health officials who say the fast spread of the illness doesn’t portend well for flu season. “We’re definitely concerned that this may be an indicator of a worse season than normal,” said Michelle Vowles, an epidemiologist with the Salt Lake County Health Department. Though it’s not clear where exactly Utah’s cases of norovirus started, schools in Utah County were the first to report kids out sick with the gastrointestinal illness that causes vomiting and diarrhea. There were at least three confirmed cases there, including one in Orem, at the beginning of September, said Alpine School District spokeswoman Kimberly Bird. The day after the district sent out a letter about the illnesses, 10 percent of students in Saratoga Springs and Eagle Mountain skipped class. The typical absentee rate is 2.5 percent. “That easily could have been the start of it,” said Aislynn Tolman-Hill, spokeswoman for Utah County Health Department. Norovirus seems to have moved north from there into the schools of Salt Lake County, where, Tomlan-Hill added, “it’s been spreading like wildfire” this week and last. At least 10 schools have seen clusters of three or more cases. At Canyons School District, there have been calls from about a dozen parents a day reporting that their kid’s doctor told them they have norovirus. None of those have been confirmed by lab results, said district spokesman Jeff Haney, but the custodial staff has been doing daily deep cleans with hospital-grade disinfectants at all of the schools potentially affected. Jordan School District has had cases at three schools; Salt Lake City School District, two; a charter school in Murray, one; and at Granite School District, “across the board,” said spokesman Ben Horsley. “It’s clear that there are students impacted by this throughout the district,” he added, noting that “dozens and dozens” are sick but it’s probably not up to 100 cases yet. 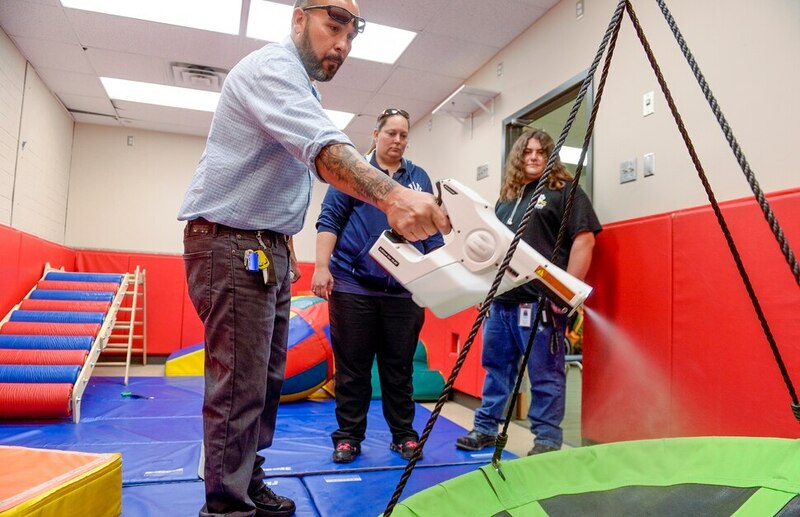 Granite District uses misters with anti-bacterial sprays every week in each classroom — which it had scheduled to prevent a hard flu season and is now using to slow the spread of norovirus instead. Utah Department of Health epidemiologist Laine McCullough said state experts aren’t sure why the virus is spreading so quickly this year. Outbreaks typically occur in winter when people are more often in close contact. “We haven’t had anything like this before where we keep hearing about more and more schools,” she said. The illness transmits easily and most often when someone who is sick doesn’t wash their hands thoroughly after throwing up or having diarrhea. Surfaces they touch can then carry the virus. If someone vomits in a classroom, too, the illness can spread in the air around that up to 25 feet. It only takes 10 to 100 particles to catch the bug. Vomit usually carries billions. McCullough said anyone who is sick should stay home from school for at least 24 hours after the symptoms have ended. At Jordan School District, about 15 percent of students called in sick after cases popped up in three elementary schools: Fox Hollow, Mountain Shadow and Terra Linda. The district has focused a lot of its sanitation efforts on its buses. Vowles with Salt Lake County Health Department said it’s possible this bout of norovirus is a new strain, and she’s waiting for lab tests to confirm that. Those are typically seen every two to four years. There were new strains in 2015 and 2017, so it would be unusual but not impossible that a new strain is causing this year’s disruption. It’s possible, too, that another wave of norovirus hits again in the winter, when it typically does, along with influenza, which could also hit harder.